The Foundation launches this campaign to promote recycling and reusing textiles, on the eve of the European Week for Waste Reduction (EWWR) and the National Congress on Environment CONAMA. #pasaturopa #clothesline campaign is supported by a video in which much of the Humana team of textile sorting center in Leganes participates, in the site www.pasaturopa.org and diffusion in social networks and media. The purpose is to achieve maximum impact and thereby promote greater awareness of the positive impact on the environment that has the textile recycling. The EWWR, which takes place from 22 to 30 November, is an initiative which aims to promote and implement actions to raise awareness of sustainable resources and waste management. CONAMA be held from 24 to 27 November at the Palacio Municipal de Congresos in Madrid. This is the event dedicated to the environment, in which Humana will be exhibiting (stand 45, third floor). It is estimated that a person buys approximately 16 kg of clothes and a significant percentage is used rarely ... until his life ends up in the trash or in a container, textile waste, in the best case. Of all the items that the Spaniards discarded each year, only one in five is placed in a container or textile waste is delivered to a specialized recycling organization. A high percentage of the clothes that no longer serves us can be used again, reducing the volume of waste. Because, if the clothing is already produced, why destroy it and produce it again? Reuse and recycling help save natural resources and energy that would be used to produce new garments. Is estimated to produce one kilo of cotton supposed 6,000 liters of water, the emission of CO2 and 3.6 kg 0.6 kg The use of fertilizers and pesticides 0.3 kg. 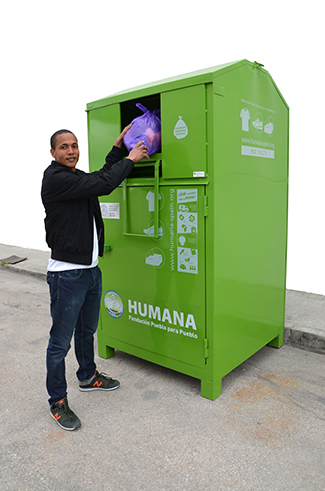 The clothing is collected annually in each container Humana going to stop a landfill and therefore being incinerated, would produce 10 tons of CO2. 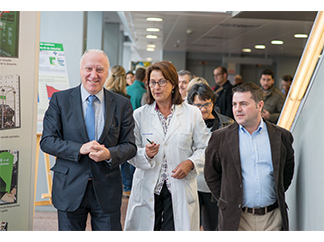 • Exhibition "Textile recycling and environmental protection" in the hall of St. Augustine Hospital of Avilés. From November 24 to December 5. • Workshop textile recycling in the Hospital of St. Augustine for pupils and students of the College The Quirinal. 70 boys and girls participating. The November 25. • Play "Humanízate" by Tres Colores, targeting 180 children The Quirinal College. The November 27th. • Roundtable: "Objective: zero waste" - Investigating Health Area III with "4R's": Reduce, Reuse, Recycle, Accountable. With the participation of responsible health care area, Cogersa and Humana. The November 28th. Catalonia• Information campaign on textile recycling alongside Caprabo Supermarket. Last year, the campaign allowed to collect in chain establishments 2,359 kg of clothing worn during the Week. • Collaboration with the campaign 'Renova's teva Steal', by transferring donkeys to fluffing clothes. It is a clothing swap campaign to promote responsible drinking and waste prevention. • Awareness raising eight municipalities: Montgat, Salou, Valls, Navarcles, El Vendrell, Sabadell, Sant Feliu de Llobregat and Sant Antoni de Vilamajor. On 22 and 23 November.